Take a bunch of cyclists, some love shaped balloons, and a few grouped miles around London by the way of Greenwich, and you have the Little Wheels love ride – a cycle organised by two Northern ladies, Danielle Fejer and Sam Dunn, more formerly known as Little Wheels. Whilst Little Wheels is a creation filled with the adventures of this pair, along with lots of cycling appreciation, their efforts to get both new or advanced cyclists meeting up together and out on the road, go further than just that. These passionate female cyclists are examples of what the world of cycling needs more of. Within the realm of gender, many areas of sport have adapted to the need to change and equate, and whilst they may still have room to grow, that growth is still occurring. Cycling may be moving, but much more slowly. At the top of the sports’ agenda, the Tour de France stands, and even after first taking place in 1903, the event organizers still insist that women aren’t allowed to race within this field of men, and for no physically relevant reason. This is just one example within many that could potentially deter younger ladies to take up the sport, in perceiving that those goals belong solely to one gender of the two. 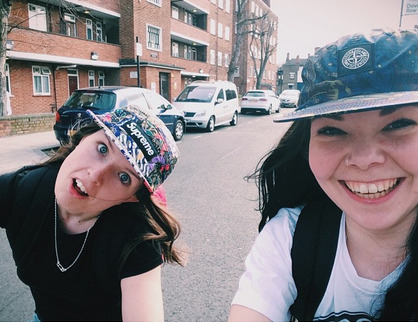 Whilst Danielle and Sam aren’t cycling professionally, or trying to make a living on two wheels, their adventures, and passion for cycling, are infectious, and allow more room to get more women into cycling and find their confidence. Group meets like the Love Ride, and their ladies Cake Ride, are encouraging nudges for more women to not fear life on two wheels, but to see the fun in it, and to come along and get involved with these two Northern lasses. More Little Wheels rides for the Summer, and regular updates from this duo, yes please.